← What is behind the label? This essay is an argument for moving towards national organization in the United States. It explores the limitations of political organization today, recent positive experiences, and possible ways to build on the present to push forward. In the midst of the worst economic crisis in decades, the left stands at a crossroads. Despite widespread anxiety, restructuring, stirrings, and disruptions, the left has been unable to respond or develop bases for movements and revolutionary organization in any meaningful sense. In many ways the eruption of the Occupy movement onto the center stage with all of its weaknesses in politics, structure, and dynamics, was a reflection of this. The events of Wisconsin, Occupy, the Oakland General Strike, and the May 1st mobilizations have brought to the fore the nature and potential of combative movements from below as well as the limits of present politics. At the very least since the financial crisis of 2008, social activists are looking for clearer paths towards anti-capitalist alternatives. Many are realizing that something more is needed beyond endless activism, protest politics, and vertical-style union and NGO mobilization. The base level of political education on the left, provided largely by non-profits and liberal university campuses, suddenly seem to have even fewer answers than before. This has left many turning towards political study to deepen their analysis as well as taking up questions around the need for political organization. We need to ask ourselves, in this time of crisis how can movements be built in an atmosphere of ruling class assaults, disorganization of the popular classes, and sporadic resistance efforts? What are the roles of revolutionaries within movements? What are the strategies to keep ourselves going for the long haul work that radical social change requires? What are the lessons of the past decades in social movements and revolutionary organizations? How do we politically develop the existing revolutionaries and help shape new ones to build a larger milieu of revolutionary organizers, thinkers, and supporters based in popular struggle? How would this milieu and potential political organization relate to broader social movements, other forces on the left, those we share perspectives with, and with those we do not? Our starting point for this is recognizing, as others have pointed out, that many, if not most, of those active on the left do not believe in political organization.1 There are many reasons for this, but the reason voiced most frequently is that they do not see a need for organization. Beyond broad social movements, they view many of today’s groups as being disorganized and irrelevant. Others are put off by the poor internal culture of today’s organizations with their tendencies for personalizing conflicts, being unable to have constructive debates, and the culture of battles in meetings that seems to isolate rather than integrate members into broader society. The closest experience with left political organization is commonly that of the lone leftist selling strange newspapers at rallies. Frequently political organization as a whole is solely viewed through the prism of negative experiences with members of the worst of Leninist organizations with sectarian approaches to debate and relating to other political forces within organizing spaces, attempts to dominate and control leadership of struggles, and a ‘newspaper as transmission belt of political line’ approach to politics. Those on the left broadly adhering to anarchism fare only somewhat better, in our experience mostly falling into the previous three objections or alternatively the turn away from political organization is based on a reaction to the weakness, political immaturity, and lack of experience observed in existing political organization efforts. These experiences though valid, involve a failure to think beyond the present; a failure to consider the possibilities of the future. We believe that political organization, rather than being a distraction or worse destructive, addresses problems in struggle today. The need for the political organization of militants roughly falls into two categories: immediate and practical needs, and broader political vision and strategy. First we must start with why political organization can address the practical and immediate needs of movement. As resources become more scarce, people are displaced, unemployment takes it’s toll, and communities are dispossessed of their long standing resources, the need for a united and coordinated means of organizing and fighting grows more crucial. Not having political organization means relying on the winds of chance when organizing efforts emerge, to bring together militants under various banners and projects, cobbling together resources for each fight, and then scattering to the wind again once the fight subsides, often leaving behind little analysis of strengths and weakness of the fight that occurred. Further, the relationships and politicization that arise out of fights are often not furthered and maintained in order to continue to build future fights. This isn’t to say that we can’t try to outlive struggles without capital ‘P’ political organization. We can and should. But a political organization, in one form or another, is a tool, which can help us do that work more systematically. While not a panacea or even the deciding factor necessarily, it does expand what we can do over time. Political organization provides a space for reflection, and deepening of the lessons of struggle amongst like-minded people that wouldn’t otherwise meet together. It can be a place to weave disparate experiences into a coherent whole. Work is divided by issue, location, and the necessary political mix that movement work needs. While it’s possible to try and institutionalize sharing experiences and strategizing across projects, sustaining this systematically is difficult. Similarly, different and higher level conversations are possible amongst militants who share fundamental aims and analysis. Since struggles ebb and flow, gain or lose their libertarian character, political organization can give us extra tools to understand and work in changing conditions. Extrapolating from this, a national political organization creates the widest level of discussion across a broad range of experiences of like-minded militants. With smaller regional or localized groups conversations are often limited to a smaller pool of individuals, with more limited resources, and less experience. A useful concept is that of the ‘political home’, in which political organization acts as a ‘home base’ creating “a place for discussion and creation of a vision to guide the organizing efforts of revolutionaries, and a place for reflection, development, and growth” of similarly minded militants.2 The idea of the political home is useful to newly developing anarchists, in providing them with a community they can identify with, and grow their political development with. While for experienced militants, the political home is useful in creating a community of ‘co-thinkers’ to reflect, engage, carry them through the long haul of highs and lows of struggles, and to develop theory with. Beyond practical issues of coordination and a home base of militants there are more systemic level issues such as: the often uneven levels of political development within movements, incipient small group mentalities, excessive inward focuses that often relies on the social glue of key militants and thereby stymies growth beyond an immediate circle, and the lack of a healthy culture of internal criticism. Unaddressed, these issues together hinder the emergence of a vision around what we call ‘the anarchist project’, which we will speak more on in the discussion around vision and strategy. The issue of political development and popular education is crucial. Whether we grow as a movement, build and retain individuals, reflect the makeup of the working class, have a movement where people can articulate an anarchist perspective, defines whether or not anarchism is a growing and meaningful force that is rooted in struggle or whether it is a marginal philosophy. Individuals, or sometimes layers of individuals working together, often begin their process of politicization and involvement in social struggles when they begin to question the ‘common sense’ assumptions of capitalism, patriarchy, racism, and other power relations. These questions then can give way to deeper systemic questions of how do we understand the system at a deeper level, what we can create beyond the current social order, where does our work fit into the larger picture of reaching a new society, and what language and tools are helpful in describing and thinking about all of the above? Individuals are generally left on their own devices to grapple with these burning questions and reflect on their experience. Informal mentorship and individual study are currently the norm for political development on the left. Isolation is the default practice. Despite all the emphases on acting collectively on the left, individuals are largely left on their own, to work through the deepest issues. We must ask though: Who receives the mentorship from whom, if at all? Who is able to successfully navigate individual study and the political minefield of facebook posts, blogs, political forums, and websites that are so important in shaping the narrative of radical politics? The answer is that this process is often gendered towards men, and reflects existing class, race, education, and geographical hierarchies. The political isolation of thinking alone reproduces existing negative social relationships. All of these contribute to the entrenchment of activist dynamics, lopsided development, and holds back the building of a rooted, diverse, and more representative left. Here Dolores identifies specifically the isolation related to grappling with work. It isn’t that there aren’t lessons, critiques, or ideas being developed by militants. It is that they have not found a framework for uniting with others to work through political questions and proposals (either those developed by the broader left or by building them themselves). This is where political development and broader popular education efforts can intervene. While the efforts of localized or informal groups can do some of this work, it is far more effectively done drawing from the collective experience, skills, and resources at the national level. Organization is a method for building a common set of references and conversations among wider layers about theory, practices, and methods of organization. This leads us to the broader issues of vision, strategy and what we call the “anarchist project.” The anarchist project is what we use to describe the cumulative efforts- whether at the level of action, organization, culture or consciousness- that give birth to revolutionary social change and bring the vision of anarchism into reality. No doubt this is a huge endeavor that requires the efforts of many; millions in fact. But this compels us to ask the question: What advances the anarchist project and what hinders it? How do we begin the discussion of a new society with the tens of thousands active in changing the world and then perhaps the millions who are not (yet) active? How do we make the ideas and values of anarchism not just a part of those conversations but a tangible proposal? Certainly political organization is no complete answer for these questions, but it gives us an important tool to put forward our ideas and vision in an amplified way. This is true whether through propaganda and literature, social media content, popular education and political development activities, and importantly through the coordinated organizing work we do and the discussions that are inevitably raised in that work. Political organization can give us additional tools to begin addressing these issues. Here Ramirez, an anarchist militant of the FeL, is answering how the FeL shifted from a largely ideological political group that numbered in the dozens to a political force in the hundreds at the center of society-wide ruptures. Key to this was not simply their demands nor the time period, but also the framework for developing their struggles and deepening them through ongoing practice and assessment. Common concerns and objections, raised by the most active and intelligent militants, within our organizations focus on our local strength and our relationship to social movements. If we are too weak locally to function in an effective capacity, how will we build a national organization? If our commitment is to struggle in and to build social movements, and our capacity is limited locally, won’t a national organization take away from those efforts? Perhaps we need such an organization, but with the state of the left and the poverty of our forces is it not a better use of our time to focus on building up the movements and small circles of affinity that will at some point down the road make political organization possible? Is it possible to build an organization that relates to movements and ‘everyday people’ and not just the usual suspects on the left? Moreover, political organizations don’t have much to show for their efforts, so wouldn’t our time be better spent just building up social movements? To these objections, we would like to state the case that a national organization in our time, in this moment, will not deter from our movement, but in fact is necessary to overcome many of our present limitations and problems. We believe a national organization with a meaningful and thoughtfully built unity and praxis can play a key role in making our desire to move beyond retreat and reform possible. This may not happen right away, and it may be a protracted process of striving towards a goal with steps forward and steps backwards, but we believe this is necessary to become a meaningful political force. For example, there is a concern that time would be better spent simply building up movement work. This is largely right. There is scarcely enough energy invested in struggle, and often the left squanders its time on self-absorbed activities more than struggles that impact people outside of left subcultures. Yet there’s a problem here too. Mass struggles do not exist nor arise in vacuums. When they do emerge, other political forces intervene. Many times, we are the same ones initiating projects as well as working within them. This is done typically through linking with others and trying to forge a united vision of doing that work. Such projects rely on informal and tacit political links; informality that often reproduces all the problematic behavior and isolation of the left but without clear mechanisms to address it. Moreover, if we allow our work to be defined by personality types and charismatic individuals who tend to begin or seize these projects, our trajectory will tend to reflect those individuals and their passing interests. Organization can allow us to experiment, learn, work together and actually work towards the collectivity so many of us as radicals speak of. Very often, in our movement work, we work together with others, who do not share our values. Inevitably some of these forces relate to struggles in unprincipled, authoritarian, and co-optive ways. We have seen from experience they do so in organized systematic manners. The organization of anarchists as a political force within struggles is thus a strategic question. In trying to build the world we want to see, we will encounter organized forces that seek to either maintain the status quo or work towards contradictory aims from our own. All the would be vanguards and those pushing to channel movements into institutional and electoral directions will always exist, but can an organized voice of those pushing for horizontal approaches, militancy in tactics, and radicalism in practice be present? An organized anarchist presence is necessary to move us forward and present a libertarian alternative. Beyond the problems raised above concerning the life cycle of struggles, there are more factors that make going-it-alone a bad option. It is difficult to work inside movements and struggles in a fragmented and often isolated manner. The political environment both within those struggles and all the forces bearing down on us make sustaining struggle in the long run unlikely without some form of unity. History is filled with libertarians failing to organize a coherent opposition until whole periods were torn out from under them. Part of this is taking a longer-term view. We need to begin anticipating problems of our work years in advance so as not to have them crushed by foreseeable political opposition.5 Political organization provides a field for advancing libertarian alternatives in an otherwise hostile environment, while lack of political organization removes tools that might soften the forces scattering us and causing us only to be reactive to the circumstances of the moment. Another objection raised is that the work we want to see isn’t happening within the organized anarchist movement, but outside of it. The organizations we happen to have aren’t up to snuff. On the face of this critique it is partially true. It should be noted that groups often don’t talk about what they do, since many long-term campaigns (particularly with workplace organizing) are not easily presented in public without endangering the participants or doing so in a way that distorts the relationship between the organization and the movement. Still, it is correct that the present movement on the whole isn’t doing the work we all want to see. Too often there is comfort amongst the radical left, some of the organized anarchist movement included, to exist as an offshoot of the broader activist subculture or as a historical and political hobby, disconnected from the daily experiences and struggles of the working class. But there is a lot of innovative work being done in the US right now: autonomous workplace organizing independent from the unions and antagonistic to the contractual-NLRB organizing methods, neighborhood organizing seizing homes and defending against foreclosures, collective direct actions against employers, landlords, and state assaults, direct actions against deportation, and countless other examples. Much of this work is carried out by other groups, with different libertarian ideologies (rarely by party oriented Leninists, though broad social changes could make them adopt different methods) and by unorganized radicals in these movements. This isn’t to say there aren’t groups doing great work right now, but those working outside dwarf the organized anarchist milieu. Still, we should look further. The divisions that exist in the broad libertarian milieu are drawn for the wrong reasons. We can’t believe today that people doing the solid work we aspire to are politically divided based on the validity of today’s divisions. In too many ways we have inherited the politics of other time periods that consistently shows itself to be inadequate in our daily practice. Given our historic task of the anarchist project, and creating a politics for our time, we cannot ignore a key responsibility we have– which is to become a pole, that attracts and unifies the forces that seek libertarian revolution, and pushes struggle further, going beyond the walls and limits thrown up by reformism, authoritarians, and the weight of the system on us all. With whatever forces we have, we need to strengthen the work we do, and find a unification that brings together those working outside of organizations and those outside of our milieu behind projects that redefine politics in our time. In other words, we should look skeptically at the existing perceived political divisions, not be held to the limitations of existing projects, and we should refuse the idea that it is not possible to bring together the best of what exists today to transform the current political alignments into a better and higher quality struggle tomorrow. It should be noted that many of these objections raised about political organization reflect fears, latent or overt, rather than positive proposals. People often are hesitant to build because of their fear that things will go sour or they will look bad. It is not that these fears and reluctances are not based on anything concrete- there are no well-paved roads in the journey of revolutionary work- rather it is that these manifest and hold back our work in a number of ways. Resistance to Occupy, “turfism”, and an unwillingness to engage and build with new militants, are examples of fears getting the better of otherwise solid and experienced militants. Yet we can’t shape our politics around our own fears, reluctance, and sideline criticisms. This is only a recipe for stasis and in the long term these tendencies act as counterweights to the anarchist project. The assumption that doing nothing is better than the potential pitfalls should be questioned. Similarly, experience in failure can make militants scared to take risks, so scared they end up missing opportunities. From a negative politics that is based around fear, waiting and seeing, and trying to tackle collective problems in isolation, we should instead be constructing a positive vision, supported by a thoughtful program of how to begin from where we stand today. Now we move to discussing the dynamics of where most of the organized and class struggle oriented Anarchist movement, along with those with sympathetic and similar politics, are at currently. Small city-based organizations that function as collectives based out of one city or regional organizations that grow out of larger social, mass organizational, and political networks should be seen as organic and practical starting points. Navigating the dynamics of doing good work on a local level is easier and keeps the scope small enough so that it’s easy for people to see the need and feel that it is possible. From what experience shows though, there are a number of recurring problems that these types of groups pose: they are weaker and more likely to fail, they tend to reproduce local and small-group dynamics, and they fail to develop the skills necessary to intervene on a wider basis. Local collectives tend to face enormous pressures. Relocation of people creates real problems, especially in highly mobile societies like the US. Having a tiny core as the center of organizations make normal life events that change people’s activity level (illness, family, career changes) into political problems. Replicating infrastructure and administration at a local level places a larger burden on groups, which might otherwise use the same energy in order to organize and do public work that sustains people. Small in-group dynamics, isolation, and social pressures all chip away at these formations, and they face these issues generally alone (often with the same failures repeated every few years by new individuals). This is especially true outside the activist urban centers where there is not enough left presence to tread water by swimming within the existing activist scene. In large sections of the country where little activist infrastructure exists, such groups often have to create everything from nothing, while facing the countercurrent of life under capitalism. Most often these groups fail within a few years. Though this is true of local or regional groups, the same dynamics exist for national groups that fail to move beyond functioning at a similar level. It’s a natural response to try and perfect one’s work in a single local before tackling further issues. Typically this does not work. In part the thinking is that with will and good organization, you can overcome common problems. While part of the problem is conscious organization, these are lessons that are difficult to confront again in isolation. While organizations tends to correspond to the broader forces of struggle in the time they exist, by limiting attempts to collectivize the problems of our time we end up putting too much time into recycling administrative problems and lose out on collaborative political approaches that we might move forward and grow from; or at least better identify our limitations and weaknesses. It is sometimes said that national organization would take away from local organizing which often stands on shaky ground. This is an understandable concern given the limited resources, time, and problems we face. Historically though, we have seen the opposite: left to our own devices there can be a steep decline of local work. In the past few decades, a number of local and regional anarchist and not explicitly anarchist organizations have been formed and dissolved in quick succession. While obvious factors might be the shaky political foundations that many groups began with coupled with lack of experience, this also follows a natural trajectory of strain from being isolated locally. Indeed most radical mass organizing projects have similar fates and trajectories. By only drawing locally, we put ourselves into a position where, as we stated previously, members moving, changing careers, having family obligations, etc., strain already limited organizations. A national organization is able to offset this both by absorbing the loss of militants to other areas, as well as building more local contacts through a visible public presence. Further, having a national organization creates a pole to attract the sharpest militants from around the country that may otherwise be isolated or, as does happens, drift in other directions politically. Allowing developing members to benefit from, dialogue, and work with a larger pool, or in other words a wider milieu, of experienced militants and talent. Numerous times we’ve read of repeated lessons learned by disparate groups. Rather than seeing these pitfalls continue, we are heartened to believe there are perhaps, some trends towards the repetition of advances, that forces are moving closer to one another despite working in parallel. There is no magic formula to overcoming the real issues both national and local efforts face. National level organizations present their own sets of problems, but we believe that they are better problems to struggle around, than the lower level problems that localized groups face on their own: attrition, stagnation, lack of resources, lower levels of discussion and less political coherence. A more fruitful way to look at these issues is that we ultimately can’t avoid investing in both national and local efforts. The real question though is how based on our needs today? In this segment we will first offer commentary on the current class struggle Anarchist milieu that the authors have been participants in and three other influential groups related to the milieu. The segment within anarchism, in the US, that has dedicated meaningful effort to building political organization over the last decade has been the class struggle anarchist milieu. The groups emerging out of this milieu, while certainly taking steps both forwards and backwards, have in the last decade made strides towards being rooted in and based around organizing activity. Still though, they have been largely localized or regionalized, and fallen victim to many of the issues discussed in the section on small organizations and collectives. There are some pressures that seem most prevalent within the milieu. First, it’s difficult to solve problems of a changing world, especially in light of the crisis and new struggles in the working class, in isolation. Organizations are running in parallel trying to solve big problems with limited resources. Second, small group dynamics dominate and hold back moving forward. When organizations are centered on personal relationships, often as cliques of sorts, it’s easy for personal tensions to overwhelm the capacity of these groups. Third, there’s excessive administrative effort relative to the amount of people involved, simply by reduplicating things like web maintenance, correspondence, publications, etc. Lastly, if larger structures are not developed for political action, the skills and methods necessary for them will not develop either. Creating a national delegated structure of locals, navigating different ideas, strategies, and methods to implement work is necessary to build capacity to respond and construct alternatives to national issues. Meaningful action needs to be taken towards addressing these issues and not merely delaying them. There are two more pressing issues that need to be taken up. Existing organization across the revolutionary left has been unable to produce solid popular and political organization, and coordinated strategic work has been limited in implementation. While in general for the anarchist milieu, the past ten years have seen moves towards social struggles as the primary front for radical activity, existing organizations have not been able to integrate and implement a coherent revolutionary approach to this work. Work centers around individuals, projects, and often driven by the winds of change without a coherent anarchist alternative being evident in practice. There is a combination of tailing business unions and NGOs, intellectual tinkering outside of struggle, highly uneven political development, and sloppy issue chasing. This again is a reflection of our time, however it is not inevitable. It is well within our reach to begin thinking and working on how the anarchist movement could have an organized and coherent expression of a movement that confronts capital, the state, and oppression through the struggles of the popular classes. We cannot change the objective situation, invent struggles, or proceed as if we have the militants we need, but we can take strive towards solutions over the long haul. Similarly, organizations have fought to build conscious political education and to a lesser extent popular education through their mass work. On both fronts, an independent and revolutionary approach to this work has fallen short. If the lessons of the 90s and 2000s were about the central role of mass struggle rather than activism, perhaps the need for a revolutionary alternative and educational work is becoming the lesson of this moment. It is the ability to facilitate creative militants, who can think and act in real time, that is the lifeblood of movements. Perhaps it is an organization’s main task to improve the ability to work through these issues, put heads together, and strategize the best path forward. There are three helpful reference points that, we believe, are useful to draw upon from political organizations of the immediate past within the libertarian left. The first would be the role of the publication Love and Rage by the Love and Rage Revolutionary Anarchist Federation (1993-1998), which emerged out of the protest politics of the 1990s. With a final press run reported at 9,000 their well-produced monthly publication featured a range of debate and was read and respected outside the anarchist milieu. While Love and Rage as an organization had a number of tendencies and practices that coexisted together, their publication stands out as an example of the creation of a visible pole of anarchism within the larger left. With the maturing of the North Eastern Federation of Anarchist Communists (2000-Present, now Common Struggle – Libertarian Communist Federation/ Lucha Común – Federación Comunista Libertaria), originally as a bi-national organization in the US and Canada, we saw a concrete reorientation away from the protest politics and summit hopping of the 1990s and early 2000s towards engagement with and commitment to building mass oriented social movements as opposed to activist mobilization. Finally, the organization Bring the Ruckus (2002-2012), in part founded by former members of Love and Rage that included anarchist and non-anarchist members, left a legacy (among many other ideas) of a collective strategy built around a common analysis. What this meant in practice was a set of criteria for their organizing work and regular evaluation of how their local level organizing met or fell short of their political goals. These three examples present starting points which we can build on to create new examples for the current political moment. The organization of today is not that of 1917, 1936, or even 2001. Our moment in history has its own needs, its own challenges, and potentials. Given the state of the left and of the working class, we can’t expect nor aim to create political organization modeled on previous upheavals. A political organization today is not the vehicle of social revolution. Struggle changes everything, including organization, and we can only try to anticipate and prepare for transformations that we cannot fully understand or control. Part of taking this into account is acknowledging that we cannot lay out the ideal picture of what a political organization should look and act like and expect all the good people to simply “get on board.” This simply won’t happen. Rather than an idealized endpoint, political organization should be seen as a process that must be built conscientiously through on the ground work, the creation of a pole of ideas, meaningful relationships, and political struggle over time. In this article we’ve attempted to give brief comments on the current political terrain, state the case for a national political organization both on levels of practical needs and that of vision and strategy in relation to the anarchist project. We’ve also attempted to spell out our criticisms of the current state of the organized Anarchist movement that exists as local and regional based collectives. Now, drawing from our discussions above, we now hope to present our vision of political organization that speaks to the needs of here and now. Some of this may repeat previous point of other sections, but we feel the need to present the vision in full and more expanded terms here. We need a different kind of political organization. Political organization today needs to speak to the needs of drawing out of isolation the current regional and city based groups and taking our efforts to a higher level with national organization. First and foremost is the need to create a common set of reference points, a healthy culture of discussion and debate and political development in all members so as to address the current uneven levels of development across our milieu. This should become an expectation for all incoming members as the political education and development of new militants will be the key site of growing, raising the quality of, and transforming our milieu. In sum these are the key areas for political work: developing militants and creating a healthy culture of debate, building a pole for deepening a libertarian praxis, expanding a coherent libertarian voice within struggle, and working in social struggles at the intermediate level. The primary work of political organizing right now is developing committed militants who can act with creativity and initiative, rather than the military model of soldiers carrying out orders. The building blocks of this work begins with one on one contact and relationship building, and moves towards integrating militants into collective study and organizing efforts. Any national formation should be working to pool resources, systematize, and develop work aimed at maximizing the potential of building committed revolutionary militants rooted in struggle. Developing internal process and curricula is one part of this. Reading groups and workshops are traditional, however not enough thought has been spent looking at how people actually learn; through practice, reflection, and taking initiative in working through problems that confront them in their work. Beyond the development of the ability to do this work, larger questions confront us. If we hope to break out of the dynamics of much of the present left where demographics and development are skewed around race, gender, class, formal education, and those from major coastal urban centers, then we need to be committed to, as members of the Furious Five Revolutionary Anarchist Collective called it, “building the new base of anarchism” which is cultivated from and draws from our base within organizing.8 A developed practice of political education will be one aspect of building a new base and two other useful concepts in our political organization tool kit should be the concept of creating concentric circles and the political home. Taken from the tradition of the Latin American especifista anarchists, the concept of concentric circles is a recognition of differences in the role and trajectory of struggle in the activity of militants.9 A concentric circle model involves organized overlapping circles grouped by levels of commitment and activity with their own respective decision making. In MAS this has been reflected by what is called the MAS compas10 circle, which involves organizing a social space for reflection on struggles, exploration of politics, and collaboration in building social struggle on a broad libertarian basis. Within MAS, there is a circle of integrating militants in the process of building common practice, understanding, and relationships with the organization. The process of integration is one of defining one’s role, but also one’s level of commitment and capacity. Members of the organization are people who have the capacity and initiative to act, understanding of the group’s political analysis and objectives, and are active in social struggles as a militant. Concentric circles gives a model where we can start at the present underdevelopment of left practice, political development and levels of commitment and over time develop and grow and deepen our relationships, ideas, and practice in tandem. The political home is a concept drawn from Amanecer, who define it as part of making political organization “a place for discussion and creation of a vision to guide the organizing efforts of revolutionaries, and a place for reflection, development, and growth.”11 In a time in which the left is largely alienated from practice, and often reflects the social ills of isolation and broader society, the political home attempts to build a nurturing environment for experimentation and creating solutions in our communities. At this time, fostering exploration is more important than winning over people to one or another line. We need militants capable of intervening and formulating their own creative approach to their situation. The political home is a place where this growth can occur. Beyond the relationship of the organization to the militant, a national organization needs to work towards becoming a pole of attraction for libertarian ideas within society. As we said, today a rigid, narrow framework of a tight organization does not fit our capacity or challenges. To believe that the positions we’ve inherited are comprehensively correct is naive and dangerous. Largely our task is to build a politics for our time. Yet, to do so we still need to have an orientation as libertarian revolutionaries. It is not the case that, just putting everyone in the same room will yield anything beneficial. The paralysis that occurs when people declare unity, though an artificial unity without any way to agree on how to proceed, is an unfortunately frequent occurrence of a left that both seeks unity and yet has little experience creating real lived unity. Against this, we propose that we should build specific projects that put our energy into concrete proposals. We live in a period where experimentation is crucial, and likewise a plurality of experiments is necessary. Organizations then should be organizing around trying out their own conception and ideas. The goal of such efforts should be to provide poles of attraction to their politics, and likewise should be looking at how their experiences play out. Rather than dissolving ourselves into an amorphous mass, the pole of attraction model argues for building our politics through struggle and praxis on the political and social movement terrain, while seeking to draw in energy and individual militants through those experiences. Realizing these goals requires exerting energy and having the means to work through our thinking, express ourselves, and enter into dialogue with others. Traditional media models, those of the left included, see media as centered around the transmission of ideas. Yet media is as much about social relationships as what we express. The work of creating media draws us into political relationships with the struggles we’re interacting with and in the process of distributing our ideas. Looking at media as a political process of social relationships, organizations should be building a libertarian voice within social struggles. In terms of social struggles, we stand in a difficult place. There are limited elements of movements, but these experiences are largely too isolated, fragmented, and insufficient. For these reasons, today an intermediate approach to struggle is the primary method we believe militants should be utilizing. An intermediate approach involves working at the level of militants in struggle united around a practical orientation to their work (unlike the mass or political orientations who target everyone or those united by specific politics respectively). The intermediate approach seeks to build autonomous power through struggle, by those reflecting on their work, taking a libertarian methodology within, and over time creating a force capable of responding to the ups and downs that occur within struggles. Further, it is united by strategic objectives built through experiences and not merely imposed ideologically. Such an intermediate force could be able to push the potential of struggles further in situations where established power breaks down. Yet our experiences in workplaces, communities, and schools has suggested that this kind of work can also give us tools in our time that are not otherwise available. An intermediate approach gives us clear work when we cannot force mass organizations that aren’t in immediate reach, nor political organization where there are no militants. We began this piece with questions speaking to the current political period and stating our case for both the need for a national political organization and our criticisms of the localized and small group dynamic that exists for much of the class struggle Anarchist milieu. But in a broader sense these points could in many ways apply just the same to much of the non-party radical left as well, whether they explicitly identify with anarchism, broad anti-authoritarianism or not. In the preceding section, based largely on our own experiences as well as examples by similarly minded anarchist militants in Latin America, we outlined a sketch of what we feel are the most useful tools and practices which speak to the practical needs of political militants and the broader goals of what we call the the anarchist project. Overall our main stresses are that if we wish to work towards and become the movement we profess to believe in, then we need to think in broader terms fighting not just for today but also for the future. We cannot limit ourselves to being the proverbial frog at the bottom of the well, convinced that the sky is only as wide as the opening of the well.13 Neither can we wait till social explosions arrive on our doorstep to build the skills and infrastructure we need – it will already be too late. We hope that the criticism and points that we’ve outlined can be a starting point towards this. But importantly we want to be clear that by stating the case for national political organization it does not mean we believe that this is automatically possible or even something immediately desired. Political cohesiveness, development and praxis14 are not end goals declared that we can find ready made formulas to create, but rather processes that are built qualitatively over time. Examples that we may be able to draw from are the Especifist current within Brazilian anarchism that has spent well over a decade linking together local and regional groups and attempting to develop a coordinated praxis under the network of the Forum of Anarchist Organizations, and most recently in consolidated into the Brazilian Anarchist Coordination. While class struggle Anarchists in North America have spent already more than five years building links and exchanges, this is not to say that ten years of work is the required prerequisite either. Likely a range of experimentation, with pitfalls and disappointments along the path, and perhaps even under various organizational banners, will provide the necessary trial and error. But the journey only begins with a firm understanding of our present limitations coupled with a vision of what we are attempting to create; after this there is only one foot in front of the other. The authors would like to acknowledge Shambhu Shunya for editorial contributions to this article. 1. “The Crisis Within the Left: Theory, Program, Organization” by BJ for the Party Building Commission of Freedom Road Socialist Organization / Organización Socialista del Camino para la Libertad. 2. “Mission Statement” by members of Amanecer: For a Popular Anarchism, a California based political organization that existed 2005-2012. The concept of the ‘political home’ is taken from the especifista tradition in Latin America and first put into use in the US by members of Amanecer at their founding conference in 2005. One of the authors was a founding member. 3. 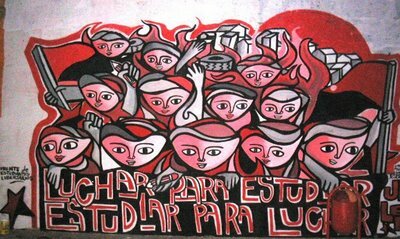 “Why Women Should Join Political Organizations” by Dolores of Miami Autonomy and Solidarity. 4. “Interview with Felipe Ramirez of FEL-Chile” Interview by Scott Nappolas, translation by Mónica Kostas. 5That isn’t to overestimate our powers of prediction. Speculative politics typically is a lottery. With foreseeable problems however we can both practice and prepare. This is different from believe that we can anticipate or build revolution step-by-step, a model which can exacerbate conservative tendencies in politics. 6. See “Defining Practice: The Intermediate Level of Organization and Struggle” by Scott Nappalos. . A follow up commentary piece is “The Intermediate Level and Trajectories of Struggle” by Nate Hawthorne . A helpful collection of documents can also available which includes “Social Anarchism and Organisation: Concentric Circles” by FARJ and “The Problems Pose by the Concrete Class Struggle and the Popular Organization” By José Antonio Gutiérrez . 9. The best overviews of the concept which should serve as starting points are “Social Anarchism and Organization: Concentric Circles” which is a translated excerpt from “Anarquismo Social e Organização” by the Federação Anarquista do Rio de Janeiro (FARJ) and “How to Participate in the FARJ?” an organizational document of the FARJ translated by Jonathan of the Zabalaza Anarchist Communist Front of South Africa. 10Compa is short for compañero in spanish, which has a political connotation to it beyond friend. 12Websites with further information on each of the groups are as follows: CELIP ; ICEA ; IAS . 14“Brazil: Elements for a Historical Reconstruction of Our Current” by Coordenação Anarquista Brasileira (Brazilian Anarchist Coordination or CAB), translation by Jonathan P.
This entry was posted in Uncategorized and tagged a/c/s, DB, Thin Black/Red Line, Tr/bL. Bookmark the permalink.